New technologies such as Web 2.0, social networking, cloud computing and mobility have dramatically affected the corporate network and the security challenges surrounding it. Bandwidth-hungry Web 2.0 applications and social media sites are overwhelming networks, and first-generation firewalls are failing to stop the invasion of new and sophisticated threats. Costs are soaring as the need for bandwidth increases - just to maintain the performance of mission critical applications. Is your firewall capable of handling the growing demands of your business while managing and securing the application-centric network? Attend this presentation to learn how the Next-Generation Firewall series from SonicWALL enables organizations to regain control of and secure their application-centric networks while at the same time lowering associated costs. Timothy A. Martinez, Western NRG, Inc.
Join us to discuss our new relationship with TW Telecom, to find out what’s new in the world from the ISP’s perspective and how this can benefit YOU! Learn about Amazon’s Elastic Cloud (EC2) and how to connect securely via a single Ethernet Virtual Circuit. CDP stands for Continuous Data Protection. Introducing SonicWALL's CDP 6.0. It's one thing to pontificate about business continuity and the advantages of a disk to disk automatic backup solution. It's quite another to hear real stories about how everyday users like you and I "fat finger" documents, files, and folders and as a result lose important, relevant data. In this brief 30 minute session you will witness how easy it is to set up a SonicWALL CDP in your network and learn how to retrieve lost data files yourself in literally seconds! The world of network security threats has changed radically and chances are your firewall isn't providing the security you need. This 40-minute webinar reveals what has changed and how you can easily make the switch to a Next-Generation firewall. Customers who have traded-up to SonicWALL will share their challenges and perspectives on making the switch from Cisco, Check Point and others. Why pay more money to your ISP when increasing bandwidth isn't always the answer? Learn how SonicWALL's WAN Acceleration solution (along with Application Intelligence and Control) can help you identify and resolve inefficiencies in WAN Bandwidth usage, while dramatically improving response times for remote and branch office workers. Join us for this 60-minute session, and discover how the new, sophisticated global policy-base control backup and recovery techniques introduced in SonicWALL next-generation Continuous Data Protection (CDP) Version 6.0 provide a more intelligent and systematic data protection strategy for small and mid-size organizations that are struggling with the reliability and uncertainty of their backup and recovery results. In this presentation, we will discuss many of the new key features in Version 6.0, and how it solves the increasing need to reduce costs associated with backup and recovery, while complying with even the most stringent data recovery objectives and disaster protection. Register now for this webcast to learn more. Is weather disrupting your business and preventing employees from doing their mission critical job? Organizations across the world continually experience business and workforce continuity challenges from many types of disruptions- including strikes, bad traffic and bad weather. Join this presentation to learn how to build a robust, flexible business and workforce continuity plan that delivers secure access to the network from any location using any device. Also learn how SonicWALL's Secure Remote Access (SRA) Solutions can dramatically increase your employees productivity, driving your revenue while your competition perishes in the cold. Ever wish you could block or limit "YouTube" traffic on your network? How about stopping proprietary information before it leaves your company? What about making sure your business applications get the bandwidth they need rather than competing with the rogue P2P, Social Networking, or Gaming applications on your network? Can a firewall give a real-time view of what is happening in my network? Spend 30 minutes with us to learn 11 cool things your firewall should do. See how firewalls can not only block all types of threats, but help you easily manage the applications and data on your network as well. Modern malware loves Web application software. While Windows was once upon the primary security concern, Web applications are increasingly becoming the most favored path of least resistance into the enterprise. As these attacks continue to become more pernicious, IT organizations are finding they desperately need more sophisticated approaches to thwarting these threats. Come learn which Web 2.0 attacks today are the most lethal and how SonicWALL security technologies can enable you to proactively defend yourself. Join this Web seminar to learn more about the three overarching, interrelated trends that will significantly impact the way organizations are managed and secured in 2011. The past couple of years have paved the way for a slew of new investments but now IT is experiencing the unforeseen impact of these technologies. Are you one of the companies that will spend 30% more on public IT Cloud Services this year? Will you virtualize nearly half of all your server workloads like many of your peers? Can you take the step towards implementing a multi-platform mobile support strategy? Most importantly, is your organization prepared for the risks associated with these investments? 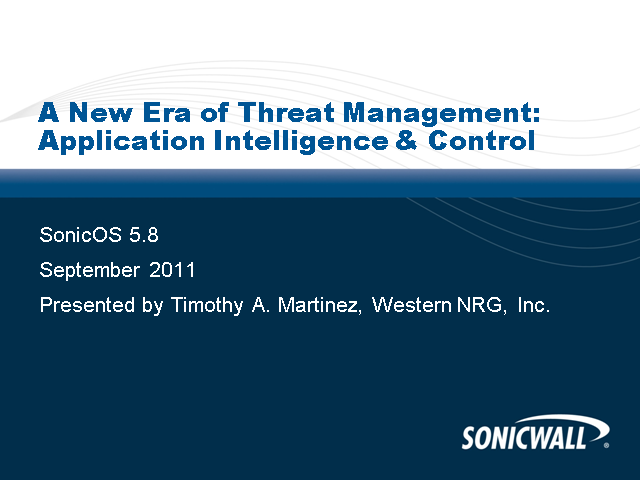 Join this web seminar for a deep dive on the key technology trends of 2011. Find out how best to utilize them and how to use next-generation solutions to protect your business from their downfalls. In today’s economic climate, increasing employee productivity and reducing infrastructure costs are at the top of every organization's agenda. Enabling employees to access network resources, from wherever they are and from whatever device, is a key strategy for improving productivity and saving money. As a result, IT is under pressure to deliver remote access to their increasingly mobile workforce, but is stumbling across the limitations of their current IPSec technology. This webinar will discuss the merits of using SSL VPNs for secure remote access, in particular the capabilities of the SonicWALL Aventail ‘Smart Tunneling’ technology. Do you know where your bandwidth is going? Have your network tools lost their ability to perform traffic shaping once applications became available online through common ports? Would you like to prioritize business apps coming over HTTP while blocking Facebook games and while bandwidth managing streaming video? Join the SonicWALL Application Intelligence & Control webinar to learn how you can regain control over your network traffic composition and over your bandwidth. Ever wished you could block or limit “You Tube” traffic on your network? How about stopping proprietary information before it leaves your company? What about making sure your business applications get the bandwidth they need rather than competing with the rogue P2P, Social Networking or Gaming applications on your network? Spend 45 minutes with us to learn 10 cool things your firewall should do. See how firewalls can not only block all types of threats, but help you easily manage the applications and data on your network as well. SonicWALL Gold Partner Western NRG is now conducting webinars! Tune in to view in-depth discussions of topics ranging from internet and email security to SonicWALL feature sets and upgrade paths. Join us for informative webinar sessions conducted by knowledgeable SonicWALL Partners! Presented by: Timothy A. Martinez, Western NRG, Inc.